The 2018 World Cup has come to an end, with France playing off against Croatia on Sunday evening and coming out on top. This is the second time that France has won the World Cup, the last time being 20 years ago. The final score was 4-2 against Croatia. French President Emmanuel Macron was in the stands watching the game and was clearly jubilant with the victory, embracing the soccer players and kissing their foreheads afterward. 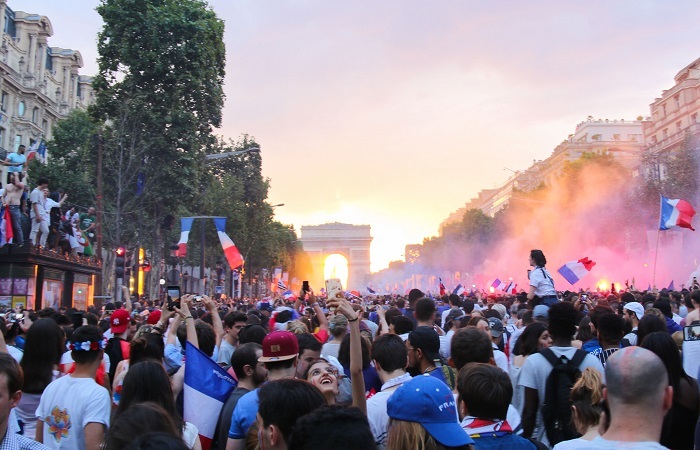 Celebrations erupted throughout France after the final whistle, with an estimated one million fans filling the Champs-Élysées. The Eiffel Tower flashed 1998-2018 in reference to France's two World Cup titles, and the Arc de Triomph was bathed in the national blue, white, and red colors. The skies were filled with fireworks and the streets filled with honking cars and revelers in high spirits, waving flags, with some setting off smoke bombs in the national colors. One celebrant said, "We've had lots of problems in France these past years" such as terror attacks. "This is good for the morale … Here, we are all united. We mix. There is no religion, there is nothing, and that's what feels good." Unfortunately, some celebrations got out of control, with storefronts being looted and windows being smashed. An estimated 845 cars were vandalized and fires blazed from dumpsters. About 100,000 police officers and 44,000 firefighters were on duty to reign in the rioters, and more than 500 people were arrested. Tear gas and fire hoses were used to induce control. These incidents occurred not just in Paris, but also in cities such as Nice, Cannes, Strasbourg, and Lyon. Two fans are reported to have died during the celebrations. Nevertheless, the country remains joyous and feels united, which is particularly noteworthy given the recent tensions over immigration. At least 15 players on the French team have African roots, however, including the young 19-year-old forward star Kylian Mbappe. People throughout France were wearing his jersey during the exciting match and subsequent victory. Mbappe, who scored four goals, is donating all of his World Cup earnings to a charity for hospitalized and disabled children.